Matsushima (松島) is one of the three view of Japan, and located in Miyagi. Matsushima literary means "Pine Islands." 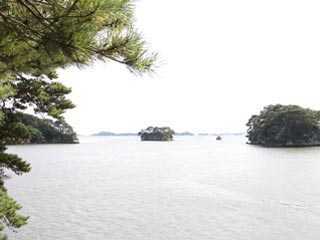 So, there are about 260 small islands in Matsushima Bay. All of the islands have names. It is also chosen as one of the 100 best geological condition of Japan because of the unique and beautiful look. There are many ferries to travel those islands, and some of them have bridge to access the islands. There are many parking, gift shops, restaurants and hotels. The famous Haiku Poet Matsuo Basho also visited here during his trip recorded in Narrow Road to the Deep North, and made great Haiku poems for Matsushima. There are four great view spots from the mountain. Mt. Omori is located east side of Matsushima Bay. It is considered as the best view of Matsushima. Not only the bay but also you can view great mountain of Sendai. Ogidani is the easiest spots to enjoy view of Matsusima. It has very spiritual view of Matsushima. Mt. Tomiyama is located north side of Matsushima Bay. It has quiet site of Matushima. Mt. Tamon is located south west of Matsushima Bay. It is very far from Matsushima, but has strong view of Matsushima Bay. Senkan Island is the most favorite island of Date Masamune. He place his tea house which was given by Toyotomi Hideyoshi, and enjoy his tea ceremony around Matsushima Bay. Oh, Matsushima. Wow Matsushima. Oh, Matsushima.